Written by Dimitris on April 1, 2016 . Batman V Superman movie is finally out! Some people loved it, many people hated it! Personally, I will admit that Ben Affleck was a good Batman and an even better Bruce Wayne. Superman was great at the looks as always. Obviously, all the budget of the movie was spent for their salaries and some visual effects, and WB didn’t have any money to get a writer. And when Bill from accounting writes your most anticipated movie’s script, you get… that (Martha? Why did you say Martha? Who calls his mother with her name?). Anyway. One of the most famous gadgets Batman is using frequently is his grappling hook. Apart from climbing, he uses it to avoid falling to the ground and he often saves falling- from-the-air civilians. These moments in Batman movies bring up arguments about if they are possible and what damage they would cause to Bruce Wayne. 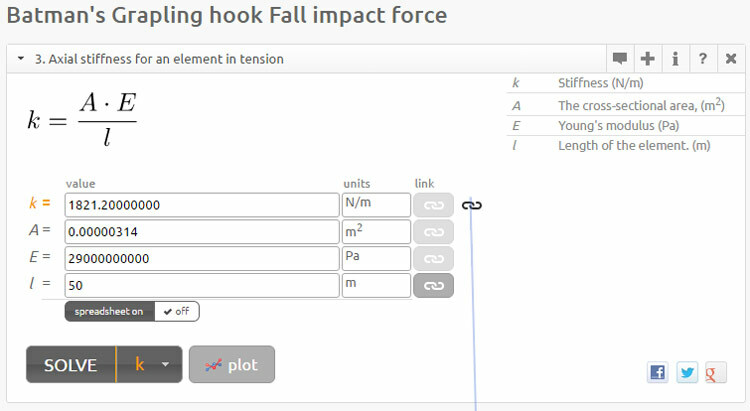 We, the fxSolver team, are not going to use standard force equations to get Force results, but the Fall Impact Force formula. In lead climbing using a dynamic rope, the fall factor (f) is the ratio of the height (h) a climber falls before the climber’s rope begins to stretch and the rope length (L) available to absorb the energy of the fall. The impact force is defined as the maximum tension in the rope when a climber falls. First we need to find the only value we don’t already know for the fall impact force equation. k, the spring constant of the rope. For this we will use the Axial stiffness for an element in tension formula. 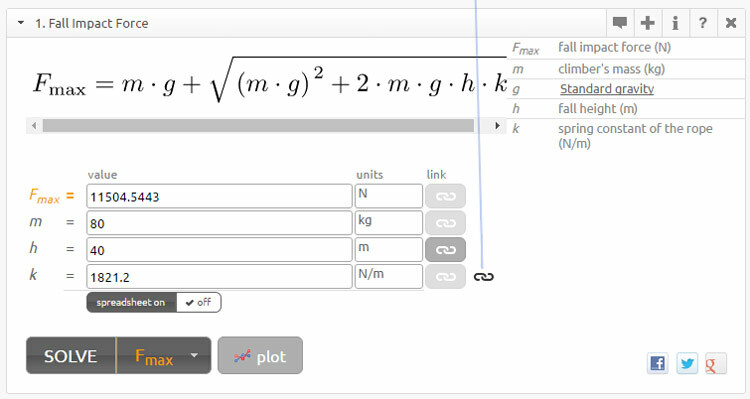 For our convenience we are going to assume that the length of Batman’s rope is 50m, and the Young’s modulus (E) is 29Gps (for a steel rope according to Wikipedia’s Young’s Modulus table). After calculating the whole thing we get that Fmax=11504.5 N.
Which means that at that point Batman alone, weighs 1173.1 Kg = 1,17 Tons. The Batman’s Grappling hook Paradox solve can be found here, and you can also check our previous post about Superman and Magneto. If you have any trouble understanding how to use fxSolver, watch our video here. Centrifugal and Centripetal Force. Plus a baby throwing machine!